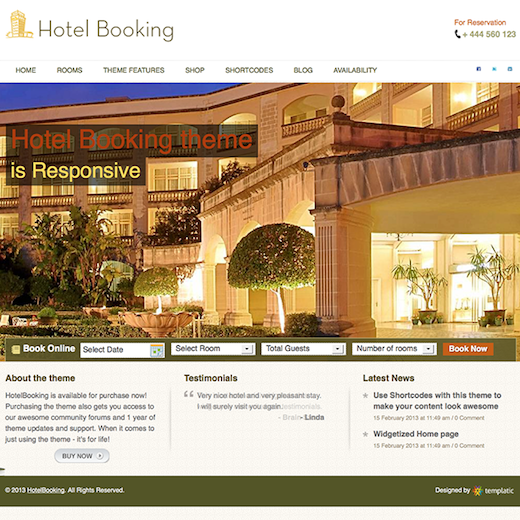 Hotel Booking WordPress theme is a sleek theme powered by the advanced Tevolution plugin and the Booking System add-on. Use the section below to read more about each plugin as well as features that are unique to CMS Hotel Booking system for WordPress. Hotel Booking Premium theme is ideal for you to manage your hotel online with great features like an online booking form a booking calendar and much more. Features also include scrolling featured images, online booking reservation module, photo gallery, google maps integrated, social media icons, special offers, testimonials and more.